Made from galvanized steel this set of three Chicken Cake Tins is the perfect storage solution for those cakes, biscuits, cheese crackers and other tasty goodies! They will making a stylish statement on your work surface and perfect in any country kitchen. A great gift for any baking enthusiast! 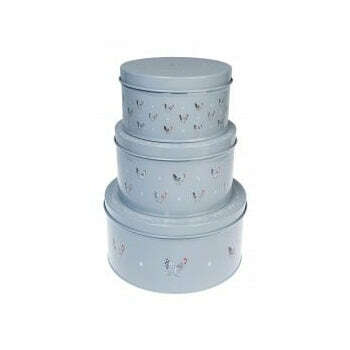 Speckled Maran hens cover the tins with a different design on the lid of each tin. They all stack inside each other. Take a peek at the matching Biscuit Tin and the other items in our Tinware Collection.